All businesses have always needed to undertake a certain amount of marketing communications and business administration if they are to prosper. We specialise in helping SMEs to succeed by providing modern technological ways to undertake these age-old imperatives in a more labour efficient and cost-effective manner. We can provide not only website design, but also a range of other supporting services to help you sell your products and smooth the running of your business. The ability to use our wealth of business, marketing and technical experience to meet a client's specific needs, sets us apart from those who have a purely technical development capability. HowesComms undertook the design and coding of their first client's website in the summer of 1997 (for PW Publishing Ltd, publishers of Practical Wireless and Shortwave Magazine at that time) and since then have developed websites, back-end and 'cloud'-based database systems for clients across a wide range of business sectors. Integrated systems for both print and on-line publishing of catalogues and publicity material, along with integrated auction display, bidding and accounts systems are among the more sophisticated projects undertaken by the partnership. Ignore the fact that governments and large organisations often spend a fortune on near-useless large IT projects. For a very small fraction of that kind of money, we provide bespoke systems for SMEs, designed to meet a business' specific needs, that run reliably day in, day out and enable them to have an edge over their competitors. If you are trying to run a business with a mix of spreadsheets and bits of paper, then we can probably help you move on to something very much better. Along with website and integrated business systems development, we also provide clients with ongoing support and additional services such as web hosting, e-commerce, photography, video, print publication origination and related services. This is our old homepage artwork from 2001! Some technology has moved on a bit since then. Perhaps when we get a moment we'll update our own website!  Create, improve or update your web presence?  Be able to easily update and maintain your own website?  Have ecommerce, cloud-based business systems, or other functionality coded to your requirements? If you would, then please give us a call. C M Howes Communications, Eydon, Daventry, Northants. NN11 3PT, England. 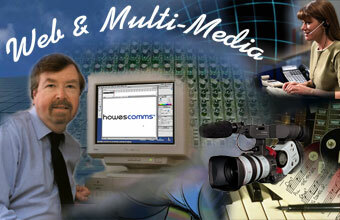 Experienced communications specialists, C M Howes Communications was founded in 1983. Partners: D A and C M Howes. HowesComms and StoryEdit are trademarks of C M Howes Communications. © C M Howes Communications 2001-2015.